For more than a century, the Peugeot name has been synonymous with French gourmet cooking. Recently, an opportunity arose for Peugeot to bring its penchant for quality and innovation to a family of wine products. Since then, Peugeot has offered a wide range of corkscrews, specialized decanters, tasting glasses and service accessories to wine aficionados worldwide. Wine lovers have their own tastes and preferences for not only their favorite vintage, but the best way to enjoy it. No one is particularly right or wrong, because the appreciation of wine is a personal experience. One point most wine lovers can agree on is that the proper tools and atmosphere enhances the senses and improves overall enjoyment. 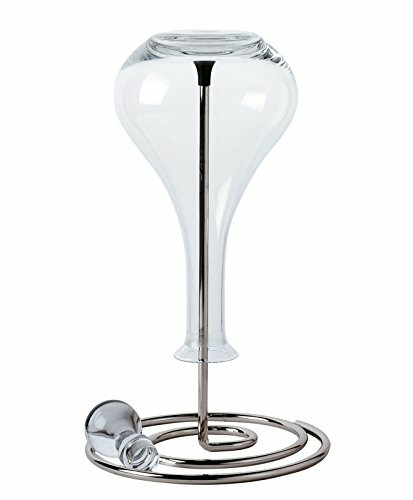 Peugeot's Revolution Decanting stand is great for draining or drying wine decanters. The nickel plated stand is suitable for most decanter types, except duck decanters. Simple, sleek design: measures 13-inch.